Beautiful villa with private swimmingpool, garden, Airco and near by the beach! Villa La Marina is the perfect house to stay at La Zenia. It is a charming, cozy and absolutely beautiful property. Staying there you can enjoy the calm, the sun, the sea and the beautiful beaches (Cala Cerrada and Playa Flamenca), short walk distance from the house (300 metres). The garden is green and completely isolated from the surrounding houses. The swimming pool is big enough and completely safe for the children, with a fence closed by key. Villa La Marina is a typical Spanish Villa with all the facilities that guarantee a perfect holiday: air conditioning, private swimming pool, a large and green garden, several outdoor spaces where to enjoy the calm and the relax of this quiet and residential area. The beach is only a short walk from the house. The very lovely and cozy furnished house has atmosphere and can accommodate 5 people. There are 3 bedrooms, 2 bathrooms, outdoor shower with hot and cold water, a completely fitted kitchen with all kind of appliances and a nice living room with a fireplace for the winter months. The house has, indeed, heating for the winter. All the windows are protected to avoid the entrance of mosquitoes or other insects and the owners have previewed the smallest details to guarantee the total comfort of their guests: air conditioning and fans in all the rooms, books and DVDs, toilet products, kitchen products, cleaning and washing goods, and a nice welcome present. The garden with swimming pool, comfortable garden furniture, solarium, chairs, different terraces and barbecue leaves no wish unfulfilled. 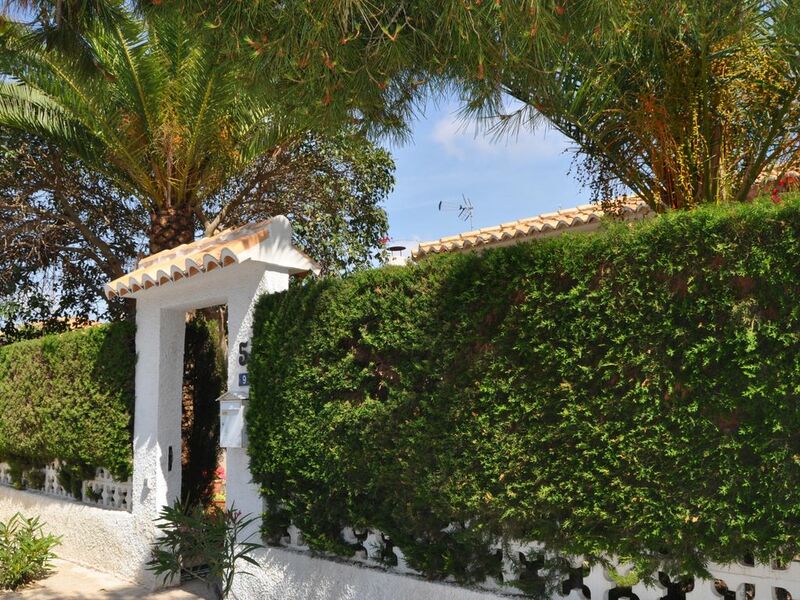 The house is surrounded by a beautiful garden, with lots of trees, a fantastic outdoor breakfast and dining areas, a garden terrace with a barbecue and a typically Spanish covered patio for the cooler days, close to the barbecue. The swimming pool is safe for children because it is surrounded by a fence with a lock in the door. Enjoy your family holiday in this beautiful house with swimmingpool. The swimming pool is big enough and completely safe for the children, with a fence closed by key. One of the double bedrooms include a new modern bathroom with shower, sink and toilet. Another small bathroom with shower and WC. The outdoor shower has hot and cold water. In the living room and in the kitchen there is aroconditioning. In all the bedrooms there are fans for the cooler months there are in every room an eutectic radiator and of course the fireplace. Beautiful villa which we will definitely return to! We had a lovely holiday at Villa La Marina. The hosts couldn’t have been more helpful and the villa itself and pool are beautiful. The gardens were secure and superb and the villa and grounds were perfect for a toddler. The air conditioning in the bedrooms and living room was much appreciated in a very hot week. An excellent holiday! Thank you so much for your wonderful review. You where wonderful guests. Family holiday - very relaxing - villa had everything we were expecting and more. Thank you for being our guests and thank you for this wonderful review. Fantastic Villa in a fantastic location. Swimming pool was great for adults and kids. Entire property was spotlessly clean and had everything in situ for a great week's holiday. Would highly recommend the small family run restaurant situated a quick walk towards the rear of the villa. Best paella ever..
We had a wonderful family holiday. The villa was so clean and equipped with everything you needed. It literally had all of the essentials. The villa had a large footprint of space so the children could run around safely as it was very secure and safe. The lady that introduced us to the villa was lovely and her partner cleaned the pool and maintained the garden every other day, they were so friendly. The area was lovely. We ate in a lot of the time but so nice to just walk down the road and be on the beach for an evening walk/drink. The beach was busy during the day but from experience we have found this is normal for Spain in Peak season! Also we were totally spoilt with the villa so the children were happy there! We can not fault this villa or the area. A very safe place to take children. Thankyou for letting us stay and I'm sure one day we will return. We went away for a long girls' weekend and had a fabulous time! The house was immaculate, comfortably sleeps 4-5 people and is in a perfect location close to the local supermarket and beach. We took advantage of the coastal walking paths, particularly the walk to Caba Rioj, to enjoy the boats in the marina and have a drink. When we weren't at the beach, we were enjoying the pool and ample outdoor dining space that comes with the house. This house is ideal for a week or long weekend away, I can't recommend it enough and would love to come back soon. La Zenia is located directly on the beach belongs to the province of Alicante. La Zenia has a very pleasant climate with a Durschnittswärme of 20 degrees and an average of 300 sunny days per year. La Zenia and environment there is almost no industry - there is the famous Salinas (salt lakes) and the air in the area is known to be very clean. North of La Zenia are the Salinas of Torrevieja and La Mata. This is a protected area, where many birds and flamingos. Visit the surrounding cities Cartagena, Alicante and Murcia. Cartagena is a beautiful city and in Murcia, you can eat excellent and very cheap. Visit the beautiful cathedral in Murcia - there are also several museums. If you arrive after 22 h: our contact person asks you to pay € 50,- for the late checkin Die Mietpreise sind inkl. einmaliger Endreinigiung, allen Energiekosten und Wasserverbrauch und inkl. Swimmingpool Sollte Ihre Anreise/Checkin in der Wohnung nach 22 Uhr sein, fallen 50 Euro zzgl Kosten für Spätcheckin an. Bettwäsche und Handtücher sind im Preis inbegriffen. Die Wintermonate sind herrlich in La Zenia. Bis Ende November und ab Anfang März sind die Temperaturen oft um die 20 Grad und auch die Wassertemperatur ist während den Wintermonaten um die 17 Grad.